If you have any questions or want to enquire about dates, use our form to contact Barbara Graham or see their website for more information. Come to retreat from the frenzy of city life. In the 1890 Victorian cottage all is peaceful and calm and Barbara looks after you beautifully. The dining room, with the odd oriental piece from past travels, is where you have your full English breakfast – unusual for London – and across the hall is the elegant sitting room, with gilt-framed mirrors, sumptuous curtains, and a piano which you are welcome to play. Upstairs is a bright, restful bedroom with pretty linen and a cloud of goose down. The large bathroom next door is all yours – fabulous. Nothing has been overlooked and the tiny courtyard garden is a summer oasis. Train: 6-min Waterloo, 3-min Victoria. Bus: 137, 452 (Sloane Sq) & 156 (Vauxhall). Tube: 10 min. Parking: £2.60/hr or £8 day permit. Weekends free. Singles £85. Stays of 2 or more nights: £110 double, £80 single. I so enjoyed my stay with Barbara, it was like being at home! But so well looked after. Nothing was too much trouble and the bedroom and bathroom are beautifully clean and comfortable. 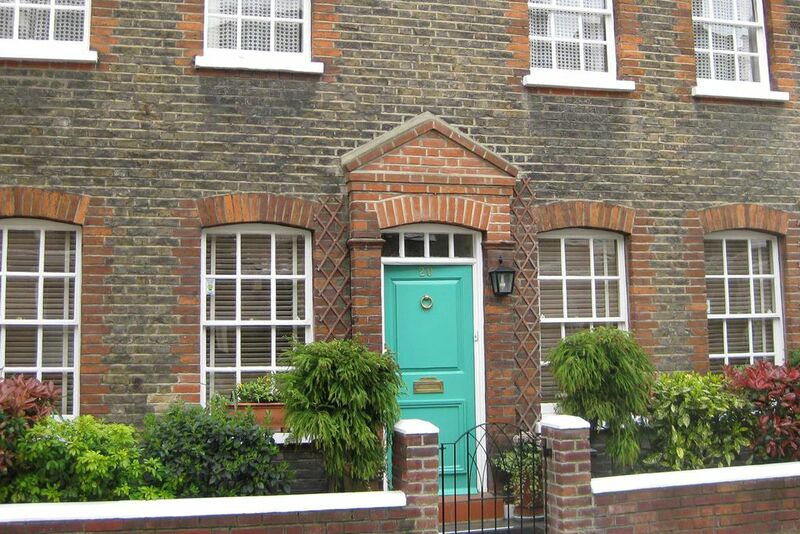 The location is excellent with transport links (bus, train and on foot via Battersea Park) within 5-10 mins walk. Delicious breakfast with home made preserves; I must return to try the full English next time! My sister and I were made so welcome by Barbara even though we arrived late after watching a long match at Wimbledon. Her house is beautiful and our room was really pleasant and comfortable with lots of lovely, thoughtful little touches.Barbara even solved my sister's 'shoe disaster' by kindly giving her a pair of hers that she insisted she no longer wore! Now if that's not going the extra mile, I don't know what is!! A lovely place to stay thanks to Barbara our thoughtful hostess who presents her elegant and comfortable home to her guests and makes them feel at home. Everything is provided for your convenience even dressing gowns and slippers! Her local knowledge is invaluable in helping the visitor to find their way around. Highly recommended. What a lovely and comfortable B&B and the host was wonderful - kind and extremely helpful. It was very quiet and in a super location for transport links to central London. Having just returned from three nights at Barbara's we have been totally delighted with her wonderful hospitality and kindness. She is the sweetest person and thinks of everything! The room is very comfortable with a spacious bathroom and tastefully decorated as is the whole house - a real home from home! Moreover, Barbara is so caring with a wonderfully twinkly sense of humour! We are much looking forward to our return visit of four nights later this month and will be booking other visits to follow. I hope she will have some vacancies - we don't want everyone to know our secret paradise! We have had a wonderful stay! Barbara has been welcoming, helpful and very gracious as we share the day's adventures with her. She has the most delightful back garden and I have plans to emulate some of the most charming aspects in my own garden. The bus routes into Westminster were very easy to manage and we enjoyed a couple of very nice, quiet dinners closeby. The room is quintessetially Victorian - we loved it. Thank you, Barbara! Barbara Graham creates a perfect London stay in St Philip Street. During London exhibitions over the past 8 years it has always proved a wonderful oasis to return to in the evenings. The house is beautifully decorated and incredibly quiet considering its proximity to central London and very convenient for the short bus ride to Sloane Square underground. Barbara is the perfect hostess, thinking of everything in advance and provides the best English breakfast at no extra charge, a wonderful way of setting you up for a long day of meetings or sightseeing. Highly recommended. Barbara Graham’s B&B is a delight. It made a comfortable base for 3 day’s energetic exploration. She warmly welcomed us on arrival and on our return each day and was sensitively informative and helpful. English hospitality at its best. Our place to be whenever we'll visit London again. Just ten minutes away is the beautiful Battersea Park and boating lake, the Royal Court Theatre and Cadogan Hall in Sloane Square. Also nearby is Omnibus, the new arts centre in Clapham Old Town which offers classical music recitals and jazz on alternate Sundays, theatrical productions as well as visiting celebrities with their fascinating life stories. Italian, Argentinian and French restaurants are round the corner whilst all cuisines can be found on nearby Lavender Hill. 575 Wandsworth Road is a local National Trust property where all interior surfaces are embellished with beautiful pine fretwork patterns by the Kenyan architect, Khadambi Asalache - bookable in advance only. Battersea Power Station, the Grade II listed building and surrounding area is being brought back to life with a unique blend of shops, restaurants and parks; there will be a new river boat service and underground station for easy access.